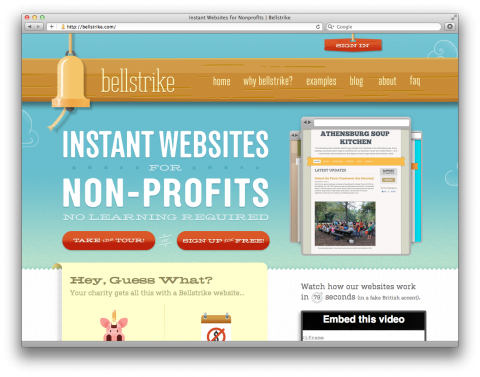 Bellstrike is a new service that allows nonprofits to launch a professional looking website in virtually no time, without any coding or design skills. But it goes beyond just being a static website; Bellstrike lets a nonprofit accept donations, send out donation receipts, get the word out on social media channels and offers the possiblity to maintain a blog. All that at no monthly cost. If someone does makes an online donation, Bellstrike takes 9.5% of the total amount and covers all transaction fees. The founders Dodd, Marshall and Sean sure put some love into all of this. Also, they have a great sense of humor. Pull the string next to their faces on the about page. But, why does the bell not ring when you click on it on the homepage? That’s what I wonder! Yikes, 9.5% seems a little steep. I wonder how that 9.5% compares to what the cost would be for a nonprofit to pay for all of these services. It would be interesting to see the actual numbers—my immediate reaction was that 9.5% indefinitely seems outrageously high, but maybe it’s actually a good value? So this is geared more to local neighborhood lemon-aid stand type of stuff? Can’t imagine 9.5% flying with any organization that takes in substantial and/or regular donations. Secondly, I just wanted to let everyone know that we’re definitely not out to take advantage of nonprofits by charging them a steep rate. WePay charges us 3.5% for transactions, so we really charge 6%, which includes a branded, full featured website with cool goodies that most small nonprofits wouldn’t be able to build out themselves. 9.5% can’t be THAT expensive, when you consider the price it would cost to pay a designer. Perhaps a sliding-scale would be a bit more acceptable though – after a certain value, it could drop to a 3.5% cut, for maintenance costs. A lot of these small nonprofits don’t have online fundraising right now so this is a risk free way for them to get started. I’m not sure how anyone can argue that 9.5% is, or is not, steep unless they are talking about their exact non-profit. And Dodd is right, you have to use 6%, because if the non-profit built their own site they are going to pay Visa/MC 3.5% anyway. Obviously this is geared at smaller non-profits who want to get a site off the ground and take donations. Not multi-million dollar non-profits. If my non-profit takes in $50k a year in donations, I’m giving these guys $3000 (6%). Good luck finding a Web designer to build a full site, guaranteed to work, with payment added-in for $3000. Oh, and that designer could deliver it today. I think this is a fantastic idea, and relative to the service provided and apparent sheer ease of use, the 9.5% fee seems both reasonable and ethical. Things like this put me in a very motivated frame of mind! When you start to think about the massive percentages professional fundraisers charge, the logistics of getting volunteers to do it, and all the related work involved,I’d say 9.5% is pretty reasonable. 9.5% is NOT steep in light of the return on investment. I would imagine that that number will be the toughest thing for reactionary first-timers to get past. It will be interesting to watch how Bellstrike frames their messaging and explains their approach to their current and future customers. Well done, Bellstrike. Go get ’em.